Since I enjoy painting the little aceo landscapes on the watercolour paper, I decided to paint a larger landscape on the watercolour paper for a change. This one was fun to paint so I might do a few more landscapes on watercolour paper. Autumn measures 7 x 5 inches and is painted on 300gsm smooth Arches Watercolour paper. Many thanks to Michael Yates for the reference photo. These wrens can be found across Australia expect for Tasmania. I love the males vibrant blue breeding plumage. The non-breeding plumage is very similar to the female which is pale brown but he does retain a blue wash to his tail and wings. 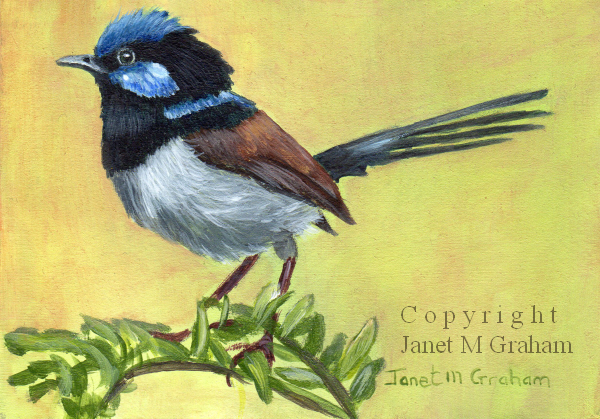 Splendid Fairy Wren measures 2.5 x 3.5 inches and is painted on 300gsm smooth Arches watercolour paper. I decided to paint another wren but in a larger format. I am really happy how it turned out. I thinking about doing a series of birds with the same neutral background colour as I think compliments the bird rather well. Many thanks to Wayne Butterworth for the reference photo. This is another one of our Australian Robin's. The red-capped robin is the smallest red robin and it can be found in Queensland, New South Wales, Victoria, South Australia, Western Australia and the Northern Territory. He was rather fun to paint. I ended up just using my no 3 round brush to paint the bird - works rather well as I can get a good point for the finer detail. 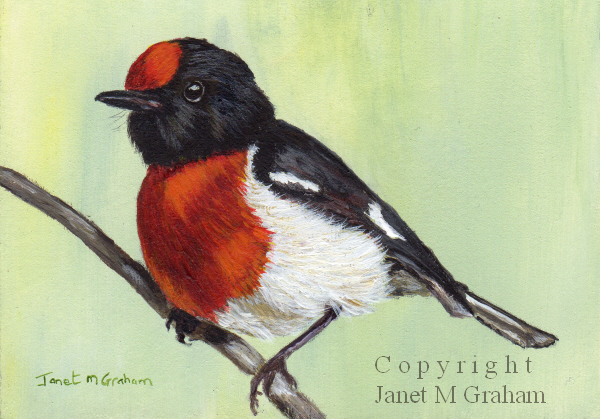 Red-Capped Robin measures 3.5 x 2.5 inches and is painted on 300gsm smooth watercolour paper. I love painting these little landscapes as I am free to paint it anyway I like and in this case I did use a lot of artistic licence to create this little painting. They are fun to paint when I need a break from the detailed paintings I do and they give me ideas for future animal aceo's scenes. I am rather pleased how this one turned out. 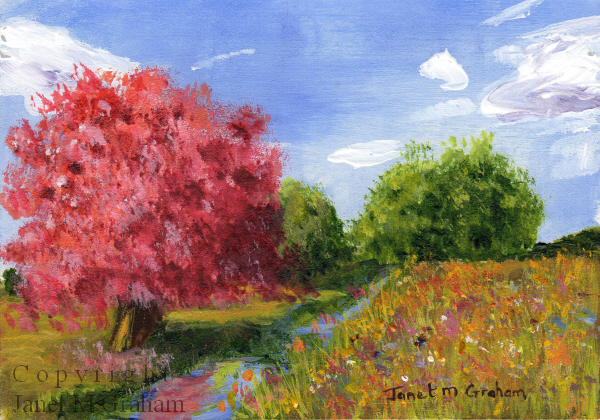 Summers Day measures 3.5 x 2.5 inches and is painting on 300gsm smooth Arches watercolour paper. I couldn't decide if I should paint this as an aceo or as a large painting. In the end I decided to paint it as an aceo but I am still thinking about painting a larger version of this lovely cottage - I have a few ideas that I want to play around with so will see how it goes. 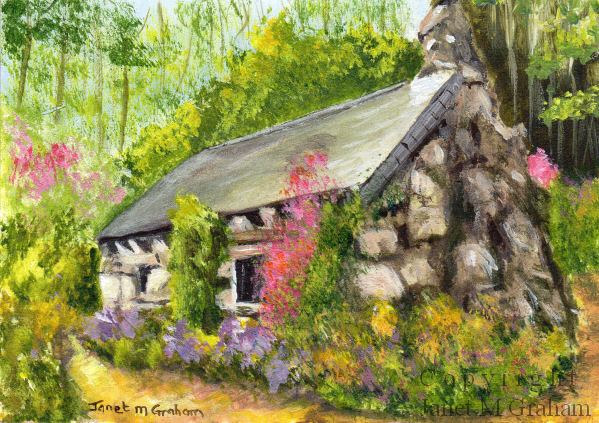 Cottage in the Woods measures 3.5 x 2.5 inches and is painted on 300gsm smooth Arches watercolour paper. I love the colours of this bird. An interesting fact is that the red pigment in the face of the bird is rhodoxanthin, which is apparently rare in birds. It is believed that the bird must acquire the pigment from its diet of insects which have eaten plants containing the pigment. Amazing how nature works. 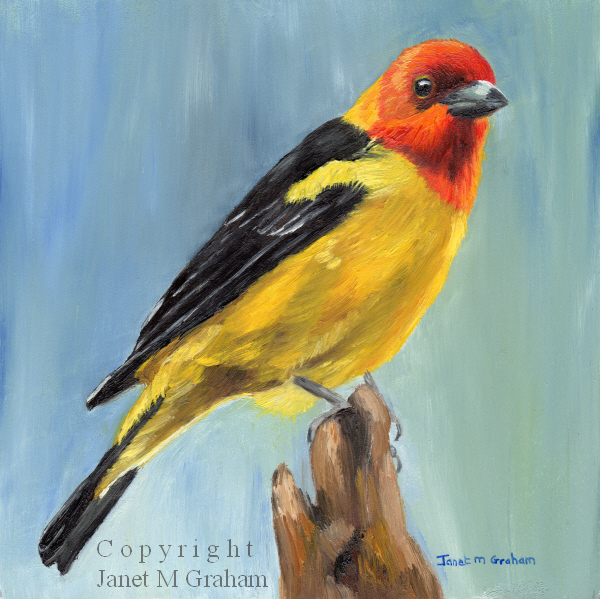 Western Tanager measures 6 x 6 inches and is painted on Ampersand Gessobord panel. Many thanks to USFWS for the reference photo. How could I resist not painting this cute little puppy. I just love his little face and his pink little nose. He was rather fun to paint. The weather has been a bit weird today - poured with rain and then the sun come out again. It is starting to turn cold so I think we are going to be in for a chilly night. Hopefully the weekend will be sunny. 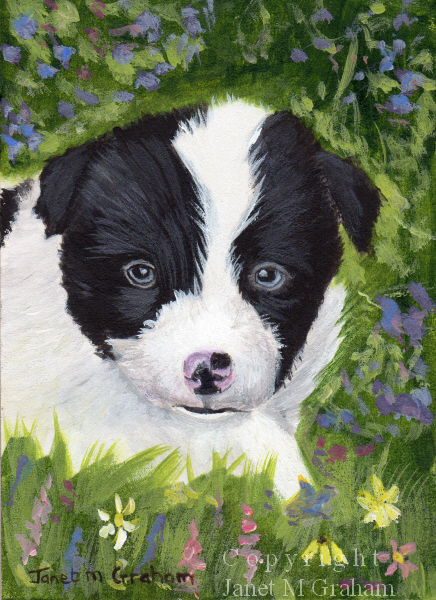 Puppy ACEO measures 2.5 x 3.5 inches and is painted on 300gsm smooth Arches watercolour paper. Many thanks to Dorothy Macready for the dog reference photo. I couldn't resist painting this robin - I love it's colouring. These robins are only found in south eastern Australia so they are not found here in Queensland. Which is a pity as I would love to see them. 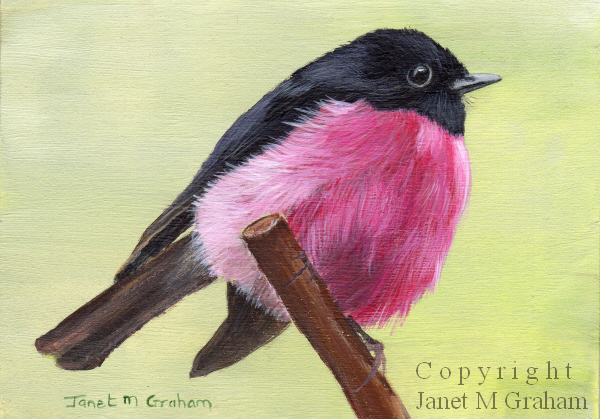 Pink Robin measures 3.5 x 2.5 inches and is painted on 300gsm smooth Arches watercolour paper. These robins can be found in the east and south-east of the Australia's mainland. I was having a look to see were I could go to do a bit of bird watching as I would love to see some of these birds and I think the best spot will be at Wivenhoe Outlook and the D'Aguilar National Park which is about an hours drive away from me. I will have to plan a day trip in the next few weeks . 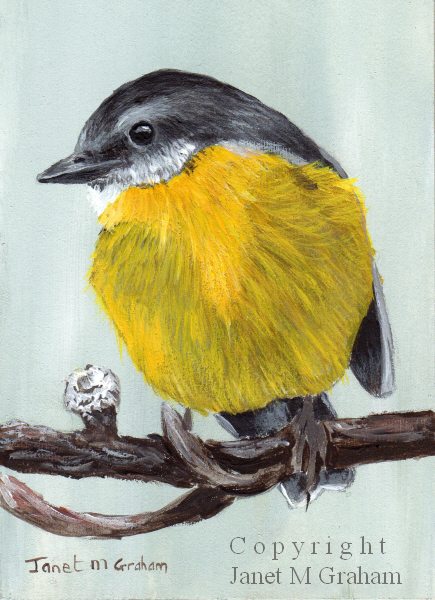 Eastern Yellow Robin measures 2.5 x 3.5 inches and is painted on 300gms smooth Arches watercolour paper. I love the colours of this one and had fun painting the sky and sea. The most difficult part was painting the sails and the little boat but I eventually got there. 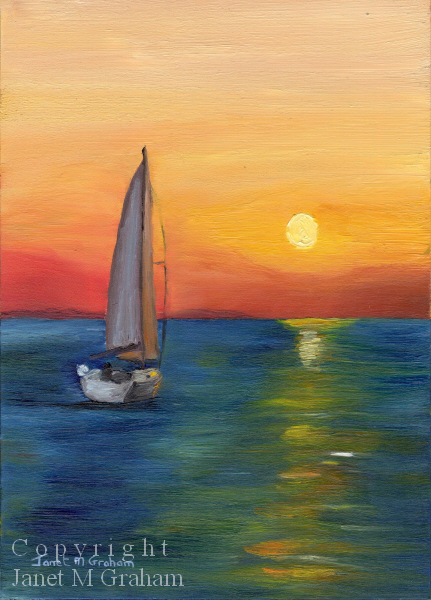 Dawn Sail measures 5 x 7 inches and is painted on Ampersand Gessobord panel. Many thanks to Ruth Archer for the reference photo. This is one of my favourite birds. I have tired to take photos of the group that lives in the nature corridor around my area but without much success - they tend to stay in the trees and never seem to stay still long enough for me to get a good shot. But I will keep trying. I originally had a greener background but it was detracting from the little wren so I toned it done a bit with a very thin wash of yellow ochre. 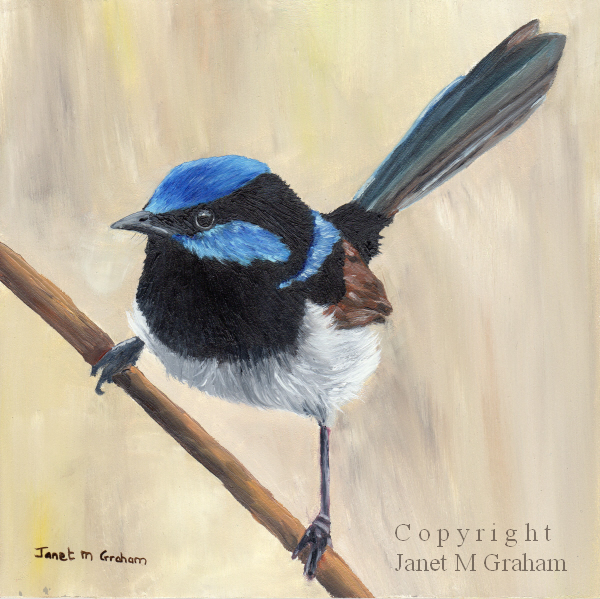 Superb Fairy Wren measures 3.5 x 2.5 inches and is painting on 300gsm smooth Arches watercolour paper. 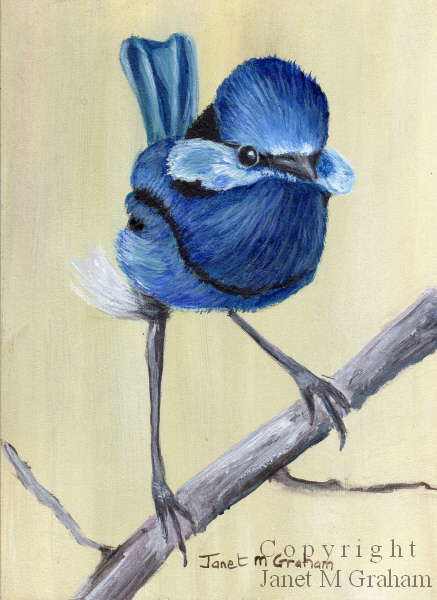 Labels: 3.5 inches x 2.5 inches, ACEO, Acrylic, acrylic painting, Bird, bird ACEO, superb fairy wren. This one was rather challenging to paint - usually I can just add white to lighten a colour but I couldn't do that this time as white turns the red to pink. I used yellow and a bit of white to lighten the red. I found it easier to work from a black and white reference photo which I have never done before for a painting - it was easier to determine the tonal variations using the black and white copy. Also, it was easier just to paint one petal at a time - was to confusing otherwise. I am really pleased how it turned out in the end. 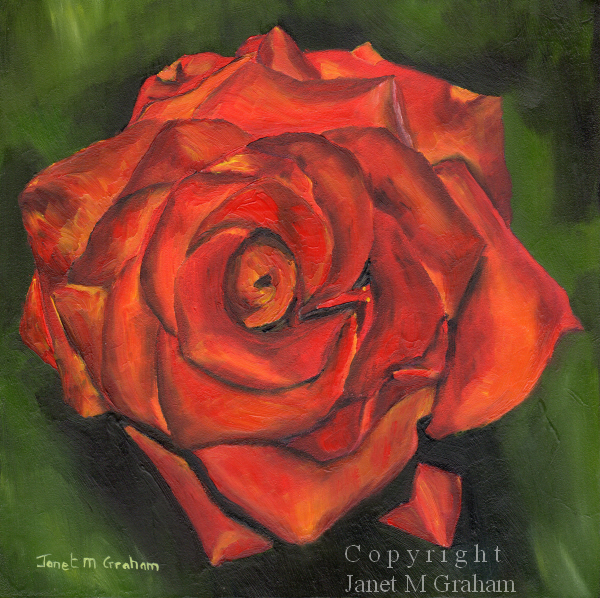 Red Rose measures 6 x 6 inches and is painting on Ampersand Gessobord Panel. Many thanks to KJ Sieloff for the reference photo. I had fun painting this one. 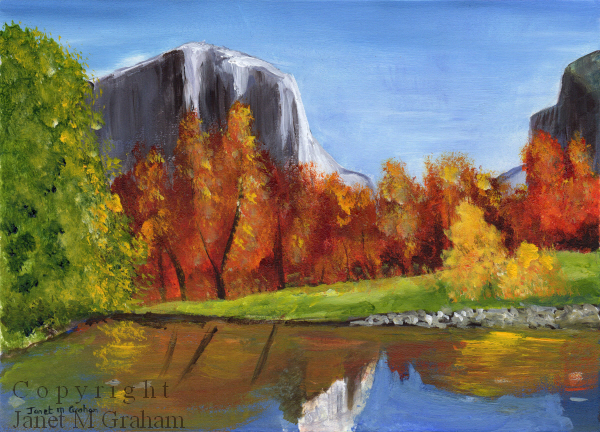 I enjoy painting the small landscapes so will have to look for some more reference photos that I can paint. At least the sun is shining today - yesterday it was raining. Fingers crossed we will have a nice sunny weekend. 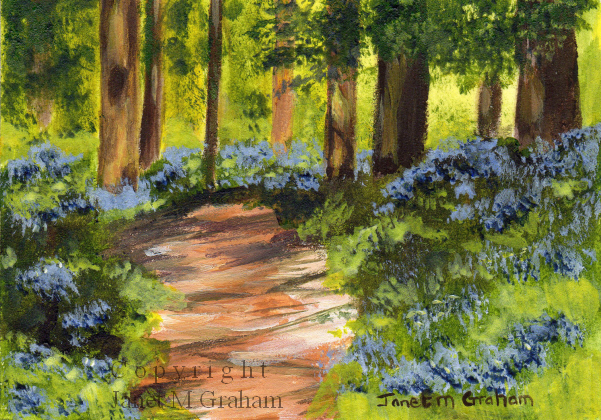 Bluebell Forest measures 3.5 x 2.5 inches and is painted on 300gsm smooth Arches watercolour paper. Many thanks to Dave Webb for the reference photo. I haven't painted an owl before but I just love the vibrant colour of this owls eye that I just had to paint it. I tried something different when painting this one - I used the acrylics more like watercolour paints and did a few washes to build up the painting. Rather pleased how it turned out. 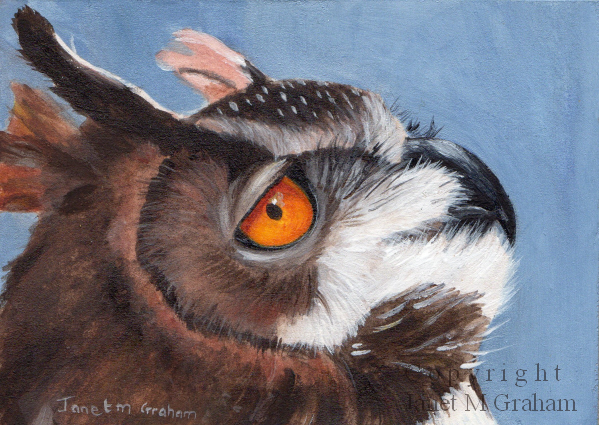 European Eagle Owl measures 3.5 x 2.5 inches and is painting on 300gsm smooth Arches watercolour paper. Many thanks to Paul Sherman for the reference photo. 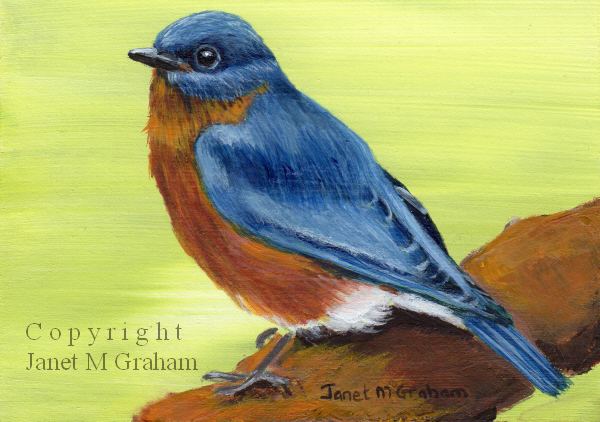 Decided to painted another Eastern Bluebird. This bird usually has more that one brood per year . The youngest born later on during summer will normally stay with its parents over the winter months which is rather interesting. Eastern Bluebird 2 measures 3.5 x 2.5 inches and is painted on 300gsm Arches smooth Watercolour paper. I really enjoyed painting this one. I thought about painting it as an Aceo but decided rather to paint it as a 6 x 4 inch. It took ages to paint the feathers. I concentrate on one section at a time otherwise it got a bit confusing. There are some interesting facts about this bird but I find the most interesting is that they help spread the oak tree after the last glacial period due to their fondness for acorns. 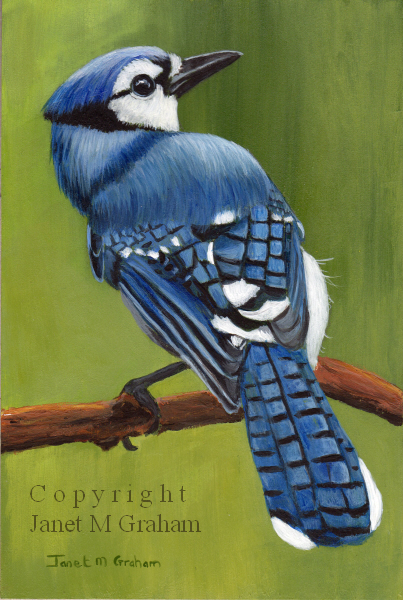 Blue Jay 2 measures 4 x 6 inches and is painted on 300gsm smooth Archers watercolour paper. Many thanks to Frank Miles / USFWS for the reference photo. It is interesting how many names this fruit is known by. In Australian we call it Rockmelon, in South Africa it is called spanspek and in other parts of the world it is also known as sweet melon, mushmelon and Persian melon. I decided to name the painting cantaloupe. We are still having a rather wet and cold winter here which is very unusual for Brisbane. Today we had sunshine which was nice after the rain we had over the weekend. Fingers crossed we will continue to have sunny weather. 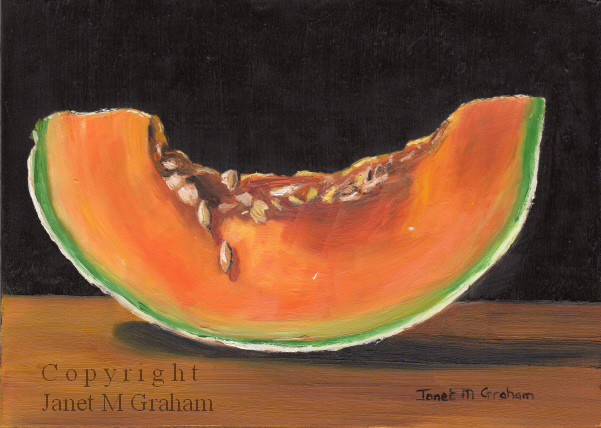 Cantaloupe Slice measures 7 x 5 inches and is painted on Ampersand Gessobord panel. Many thanks to Lillian Bell for the reference photo. An interesting fact about this American bird is that the male only molts into the bright orange plumage in the fall of their second year. Until then the young male plumage is more yellow-orange. Another interest fact is that they seem to prefer eating ripe dark coloured fruit. You wouldn't think birds would be selective when it come to food. 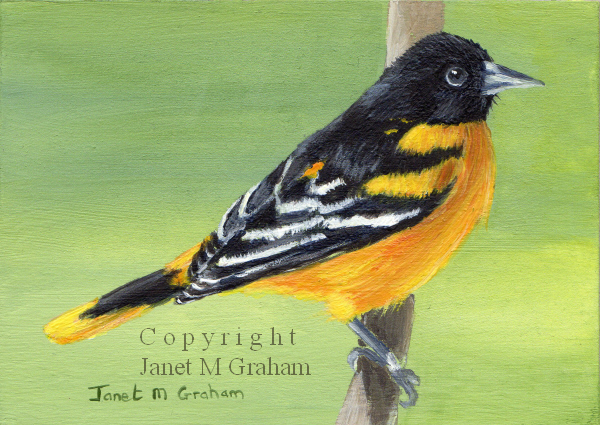 Baltimore Oriole measures 3.5 x 2.5 inches and is painted on 300gsm smooth watercolour paper. Many thanks to David Brezinski / USFWS for the reference photo.